Education-related associations, advocacy groups, and front-line challenges. Do education-related organizations work for you? Or do you work for them? Do they even work for education? Tens of thousands of education-related organizations exist worldwide. Most fit into two general categories—professional associations and advocacy groups. Professional associations are comprised of people who take on similar tasks. Advocacy groups seek to influence public opinion or policy. 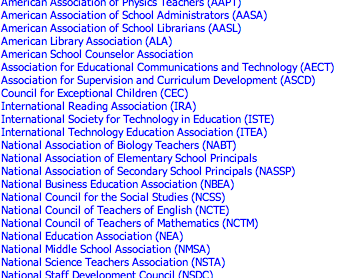 Nearly every educational role or issue has an association or advocacy group. If you perform education-related work then you probably belong to at least one. Associations and advocacy groups typically have a goal to benefit their members (you!). That goal is reflected in their documents—by-laws, mission statements, job descriptions—that set forth their purpose, design, and governance. These guide their work and how it is carried out. Staffing and activities, for example, should advance their purpose and directly benefit you. What benefits have you realized from the education-related organizations to which you belong? I asked this of several teachers and principals, educators on the front line of learning. To a person, they consistently reported two benefits: a great annual conference or convention (often in a fun location) and an informative magazine, newsletter, or web site. A few respondents serve on a board of an association or group and they reported additional benefits of paid travel, networking opportunities, and speaking engagements. The comments that educators did (and did not) provide suggest two scenarios worth pondering. One is a possibility that even though an organization may aspire to benefit all its members, an individual member might not, for a variety of reasons, actually accrue advantages beyond the aforementioned “benefits.” In this scenario, aspiration and benefit, back-line and front-line, organization and member are misaligned. Not much, for example, if modern, digital technologies flatten your association or advocacy group and bring you, challenges, and it closer together for the purpose of meeting those challenges. No questions need be asked if membership and staff share operational control of the organization, generate and process feedback about the work you perform, and prioritize which challenges get taken up. If these things are occurring, then front-line challenges are being addressed. You and your organization are co-evolving. That means: when your circumstances change, the organization adapts—and vice versa. For instance, if revenues go down, members step up by recruiting new members and raising additional funds. And if a new front-line challenge surfaces, then the organization adapts to meet it. Sharing control and responding does not happen spontaneously. They result from members and organization having a similar professional understanding about the work they perform. This is only possible when relevant, digital technologies are applied in distinct and intentional ways in the design and operation of an organization. When that is done, the what, why, and how an organization accomplishes things and addresses the frontline needs of its members is quite different from the what, why, and how most organizations ordinarily do things. Within these differences resides the identity of the boss. And what you get from your association or advocacy group is determined by the boss. Mark E. Weston Ph.D. is co-author of The Learning Edge: What Technology Can Do to Educate All Children. He resides in Dunwoody, Georgia. Contact him at shiftparadigm2011@gmail.com and @shiftparadigm on Twitter. Simply using the word “boss” completely misses the spirit and the soul of the professional association I know best: International Society for Technology in Education (ISTE). A connector, a trusted source, and an effective advocate that exists as, and for, the collaboration among a robust community precisely to take vision to reality … oh yes, and to collaboratively develop and share solutions to front line challenges, too. It has often seemed to me that there is a disconnect between the multitude of education-related associations and advocacy groups that I’ve come in contact with and actual practices in the classroom. Yes, the conferences and community building are fun and valuable. But I haven’t seen much ability to positively influence what actually happens (or doesn’t happen) in the classroom, at the point of instruction. More of us should be looking for answers to the questions raised here. Acknowledging the collaborative tools available today and the evidence-based practices that are proven to support student and teacher success, the time is right for organizations to use them effectively with their members to as accurately as possible inform their work. Synching up what is known to lead to student success in and outside of classrooms between organizations and their members could serve to support the what, when, how organizations can best serve their constituents. Dr. Weston has it right. Classroom teachers are professional education’s “first responders.” Assessing advocacy groups or professional organizations should be easy. How have you helped me today? How quickly did you help me? What was the quality of the help? Did it make a difference in my performance and impact? How have advocacy groups and professional organizations improved the teacher’s capacity to first respond? What is really different when the classroom teacher gets to the fire? We still lose too many students and teachers at the scene. The hoses aren’t hooked to the hydrants. They never will be. Classroom teachers learn very quickly to bring their own bucket of water. Good comment on ISTE. I agree. I don’t think that ethos necessarily characterizes most other education organizations, however. I can think of numerous examples. Very insightful commentary on how to impact educational outcomes. Dr. Weston has really nailed the crux education innovation – getting it to our kids. The “last mile” is always the toughest! Professional organizations in the education space would do well to heed Dr. Weston’s advice and become more relevant to their members by creating communities where best practices for digital tools and education innovations are used by front line teachers, not just IT and administration. I have mixed experience with educational related organizations and advocacy groups. As a national facilitator for the School Reform Initiative, our organization strives to take on front-line challenges head on and provide meaningful resources to educators and administrators alike. Also, the National Association for Gifted Children provides educator driven webinars, special population groups, chats and much more to connect with its membership. However, I share some of same sentiment about some organizations. We, educators, are he driving force to directly impact change in how these organizations operate. If we use our voice, instead of passively paying membership fees for a tick on the resume and a good time at a conference, a shift will take place. Gave me someone to think about Dr. Weston. Dr. Weston accurately calls into question the hierarchy present in the majority of educational associations and organizations. For those of us trapped in attendance, we watch long-time members rise to power so that the minutes of the meetings can continue to be read for future generations. Leaders rarely take any educational positions, rather spend their time congratulating other long-term members for longevity rather than accomplishments. Change will only come when more time is spent listening than reporting. Two organizations came to mind as I read this post: one is the organization for whom I work and the other is ISTE – of which I have been a member for several years. In both cases, some of the work we (or they) do feels removed from the day-to-day workings of the classroom, but this does not mean that they do not have value. I personally am glad that there are people whose sole focus is to pay attention to trends and legislature that could impact education. On the other hand, some of the work that I love most literally puts me in the classroom, watching educators work their magic and helping young learners to enthusiastically grasps difficult concepts. When I work with teachers and I hear, “I’m using this tomorrow!” my day is made. In other words, there are many levels of working with educators in a given organization. Whether or not it translates immediately into the classroom likely has more to do with the line of work rather than the organization as a whole.